After an application has been coded and tested, it is necessary to prepare a package for distribution. The first task in preparing this package is to build the application for release, which mainly entails setting some application attributes. Specify the Application Icon – Each Xamarin.Android application should have an application icon specified. Although not technically necessary, some markets, such as Google Play, require it. Version the Application – This step involves initializing or updating the versioning information. This is important for future application updates and to ensure that the users are aware of which version of the application they have installed. Shrink the APK – The size of the final APK can be substantially reduced by using the Xamarin.Android linker on the managed code and ProGuard on the Java bytecode. Protect the Application – Prevent users or attackers from debugging, tampering, or reverse engineering the application by disabling debugging, obfuscating the managed code, adding anti-debug and anti-tamper, and using native compilation. 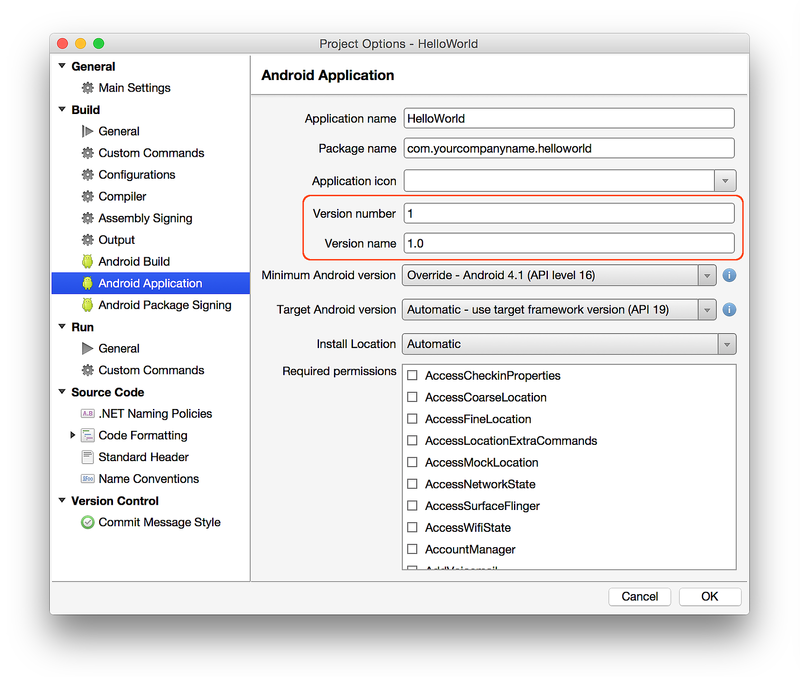 Set Packaging Properties – Packaging properties control the creation of the Android application package (APK). This step optimizes the APK, protects its assets, and modularizes the packaging as needed. Compile – This step compiles the code and assets to verify that it builds in Release mode. Archive for Publishing – This step builds the app and places it in an archive for signing and publishing. It is strongly recommended that each Xamarin.Android application specify an application icon. Some application marketplaces will not allow an Android application to be published without one. The Icon property of the Application attribute is used to specify the application icon for a Xamarin.Android project. Normally, using Android.App is declared at the top of AssemblyInfo.cs (the namespace of the Application attribute is Android.App); however, you may need to add this using statement if it is not already present. Version Number – An integer value (used internally by Android and the application) that represents the version of the application. Most applications start out with this value set to 1, and then it is incremented with each build. This value has no relationship or affinity with the version name attribute (see below). Applications and publishing services should not display this value to users. This value is stored in the AndroidManifest.xml file as android:versionCode. Version Name – A string that is used only for communicating information to the user about the version of the application (as installed on a specific device). The version name is intended to be displayed to users or in Google Play. This string is not used internally by Android. The version name can be any string value that would help a user identify the build that is installed on their device. This value is stored in the AndroidManifest.xml file as android:versionName. Xamarin.Android APKs can be made smaller through a combination of the Xamarin.Android linker, which removes unnecessary managed code, and the ProGuard tool from the Android SDK, which removes unused Java bytecode. The build process first uses the Xamarin.Android linker to optimize the app at the managed code (C#) level, and then it later uses ProGuard (if enabled) to optimize the APK at the Java bytecode level. 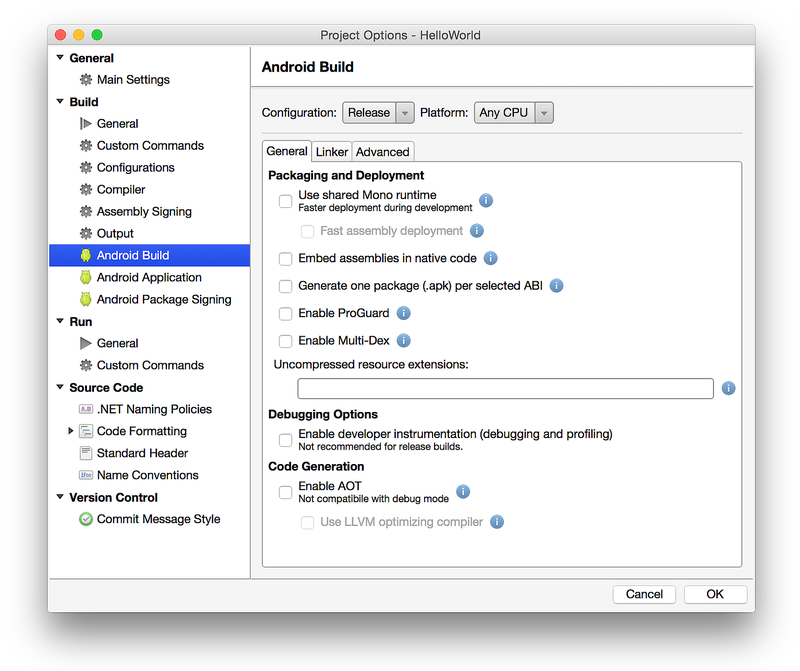 Configuration: None – Xamarin.Android 4.2.5 Size = 17.4 MB. 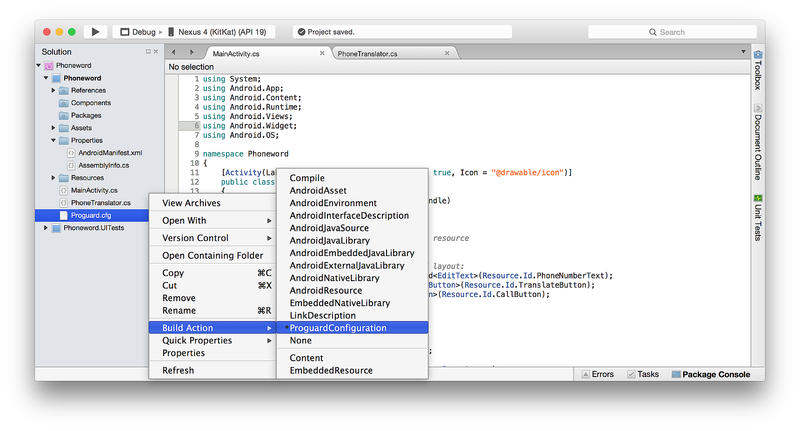 Configuration: SDK Assemblies Only – Xamarin.Android 4.2.5 Size = 3.0 MB. None – This turns off the linker; no linking will be performed. SDK Assemblies Only – This will only link the assemblies that are required by Xamarin.Android. Other assemblies will not be linked. Sdk and User Assemblies – This will link all assemblies that are required by the application, and not just the ones required by Xamarin.Android. Don't link – This turns off the linker; no linking will be performed. 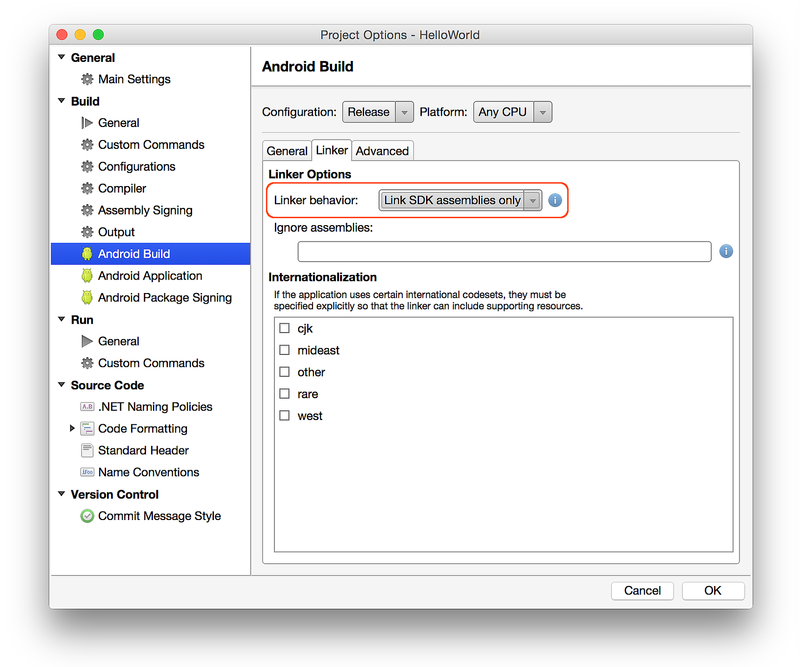 Link SDK assemblies only – This will only link the assemblies that are required by Xamarin.Android. Other assemblies will not be linked. Link all assemblies – This will link all assemblies that are required by the application, and not just the ones required by Xamarin.Android. Linking can produce some unintended side effects, so it is important that an application be re-tested in Release mode on a physical device. ProGuard is an Android SDK tool that links and obfuscates Java code. ProGuard is normally used to create smaller applications by reducing the footprint of large included libraries (such as Google Play Services) in your APK. ProGuard removes unused Java bytecode, which makes the resulting app smaller. For example, using ProGuard on small Xamarin.Android apps usually achieves about a 24% reduction in size – using ProGuard on larger apps with multiple library dependencies typically achieves an even greater size reduction. 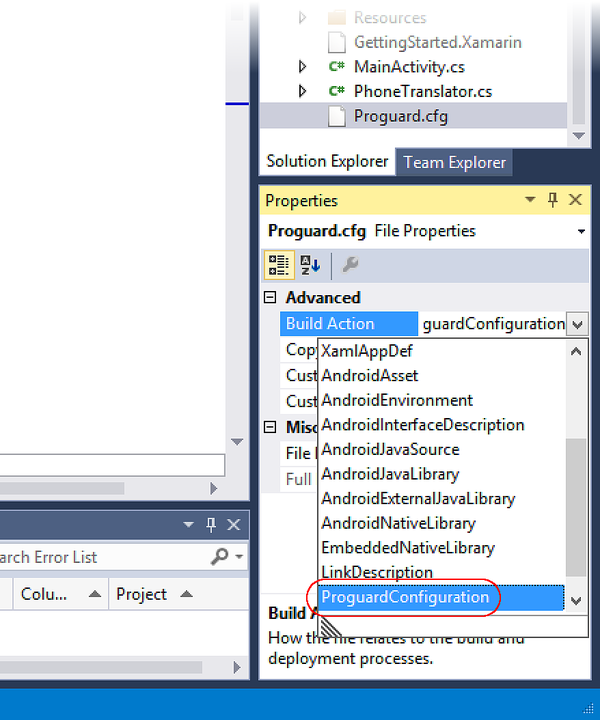 ProGuard is not an alternative to the Xamarin.Android linker. The Xamarin.Android linker links managed code, while ProGuard links Java bytecode. The build process first uses the Xamarin.Android linker to optimize the managed (C#) code in the app, and then it later uses ProGuard (if enabled) to optimize the APK at the Java bytecode level. ProGuard is disabled by default. The Enable ProGuard option is available only when the project is set to Release mode. All ProGuard build actions are ignored unless Enable ProGuard is checked. The Xamarin.Android ProGuard configuration does not obfuscate the APK, and it is not possible to enable obfuscation, even with custom configuration files. If you wish to use obfuscation, please see Application Protection with Dotfuscator. For more detailed information about using the ProGuard tool, see ProGuard. During development of an Android application, debugging is performed with the use of the Java Debug Wire Protocol (JDWP). This is a technology that allows tools such as adb to communicate with a JVM for the purposes of debugging. JDWP is turned on by default for Debug builds of a Xamarin.Android application. While JDWP is important during development, it can pose a security issue for released applications. Always disable the debug state in a released application as it is possible (via JDWP) to gain full access to the Java process and execute arbitrary code in the context of the application if this debug state is not disabled. Note that Debug builds automatically set some permissions to make debug easier (such as Internet and ReadExternalStorage). Release builds, however, use only the permissions that you explicitly configure. If you find that switching to the Release build causes your app to lose a permission that was available in the Debug build, verify that you have explicitly enabled this permission in the Required permissions list as described in Permissions. Even with debugging disabled, it is still possible for attackers to re-package an application, adding or removing configuration options or permissions. This allows them to reverse-engineer, debug, or tamper with the application. Dotfuscator Community Edition (CE) can be used to obfuscate managed code and inject runtime security state detection code into a Xamarin.Android app at build time to detect and respond if the app is running on a rooted device. Dotfuscator CE is included with Visual Studio 2017. To use Dotfuscator, click Tools > PreEmptive Protection - Dotfuscator. To configure Dotfuscator CE, please see Using Dotfuscator Community Edition with Xamarin. Once it is configured, Dotfuscator CE will automatically protect each build that is created. Even with debugging disabled, it is still possible for attackers to re-package an application, adding or removing configuration options or permissions. This allows them to reverse-engineer, debug, or tamper with the application. 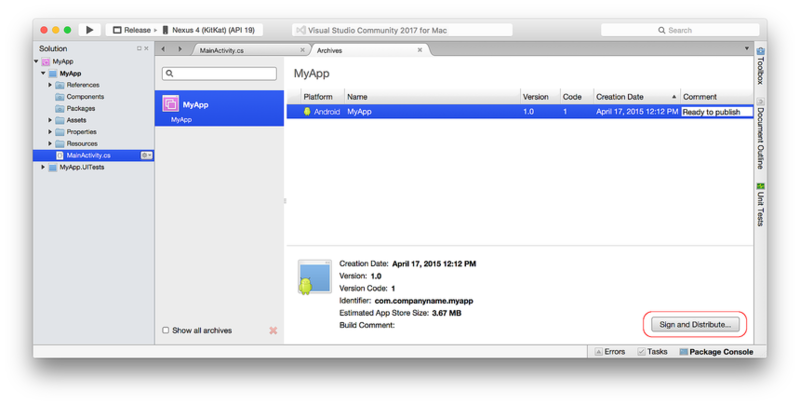 Although it does not support Visual Studio for Mac, you can use Dotfuscator Community Edition (CE) with Visual Studio to obfuscate managed code and inject runtime security state detection code into a Xamarin.Android app at build time to detect and respond if the app is running on a rooted device. When this option is enabled, assemblies are bundled into a native shared library. This option keeps the code safe; it protects managed assemblies by embedding them in native binaries. This option requires an Enterprise license and is only available when Use Fast Deployment is disabled. Bundle assemblies into native code is disabled by default. Note that the Bundle into Native Code option does not mean that the assemblies are compiled into native code. It is not possible to use AOT Compilation to compile assemblies into native code (currently only an experimental feature, and not for production use). The AOT Compilation option (on the Packaging Properties page) enables Ahead-of-Time (AOT) compilation of assemblies. When this option is enabled, Just In Time (JIT) startup overhead is minimized by precompiling assemblies before runtime. The resulting native code is included in the APK along with the uncompiled assemblies. This results in shorter application startup time, but at the expense of slightly larger APK sizes. The LLVM Optimizing Compiler will create smaller and faster compiled code and convert AOT-compiled assemblies into native code, but at the expense of slower build times. The LLVM compiler is disabled by default. 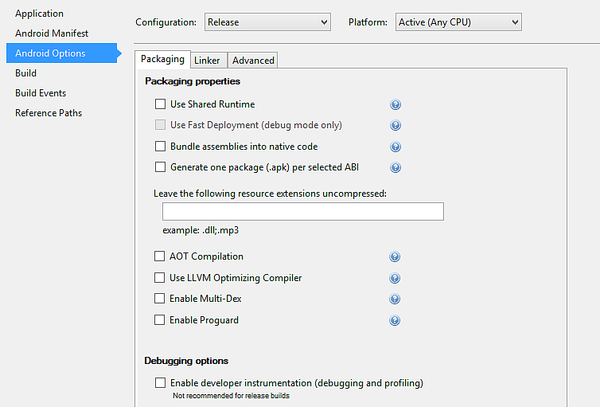 To use the LLVM compiler, the AOT Compilation option must first be enabled (on the Packaging Properties page). The LLVM Optimizing Compiler option requires an Enterprise license. Many of these properties, such as Use Shared Runtime, and Use Fast Deployment are intended for Debug mode. However, when the application is configured for Release mode, there are other settings that determine how the app is optimized for size and execution speed, how it is protected from tampering, and how it can be packaged to support different architectures and size restrictions. When preparing a Xamarin.Android app for release, it is necessary to specify the CPU architectures that are supported. A single APK can contain machine code to support multiple, different architectures. See CPU Architectures for details about supporting multiple CPU architectures. When this option is enabled, one APK will be created for each of the supported ABI's (selected on the Advanced tab, as described in CPU Architectures) rather than a single, large APK for all supported ABI's. This option is available only when the project is configured for Release mode, and it is disabled by default. When the Enable Multi-Dex option is enabled, Android SDK tools are used to bypass the 65K method limit of the .dex file format. The 65K method limitation is based on the number of Java methods that an app references (including those in any libraries that the app depends on) – it is not based on the number of methods that are written in the source code. If an application only defines a few methods but uses many (or large libraries), it is possible that the 65K limit will be exceeded. It is possible that an app is not using every method in every library that is referenced; therefore, it is possible that a tool such as ProGuard (see above) can remove the unused methods from code. The best practice is to enable Enable Multi-Dex only if absolutely necessary, i.e.the app still references more than 65K Java methods even after using ProGuard. For more information about Multi-Dex, see Configure Apps with Over 64K Methods. After all of the above steps are completed, the app is ready for compilation. 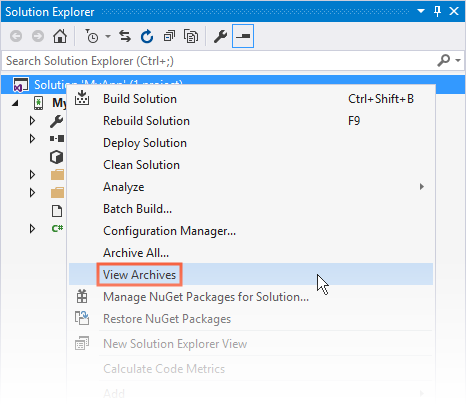 Select Build > Rebuild Solution to verify that it builds successfully in Release mode. Note that this step does not yet produce an APK. Signing the App Package discusses packaging and signing in more detail. After all of the above steps are completed, compile the application (select Build > Build All) to verify that it builds successfully in Release mode. Note that this step does not yet produce an APK. Current Solution – Displays the current solution. Note that this area may be empty if the current solution does not have an existing archive. 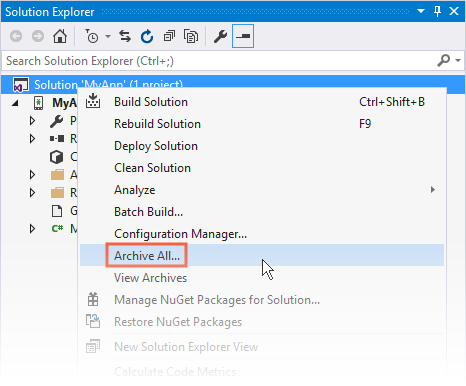 All Archives – Displays all solutions that have an archive. Search text box (at the top) – Filters the solutions listed in the All Archives list according to the search string entered in the text box. Selected solution name – Displays the name of the solution selected in the Solution List. All information shown in the Archives List refers to this selected solution. Platforms Filter – This field makes it possible to filter archives by platform type (such as iOS or Android). 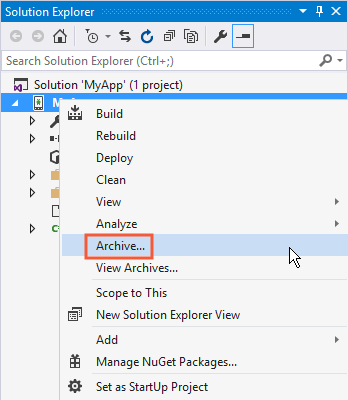 Archive Items – List of archives for the selected solution. Each item in this list includes the project name, creation date, and platform. It can also show additional information such as the progress when an item is being archived or published. The Details Panel displays additional information about each archive. 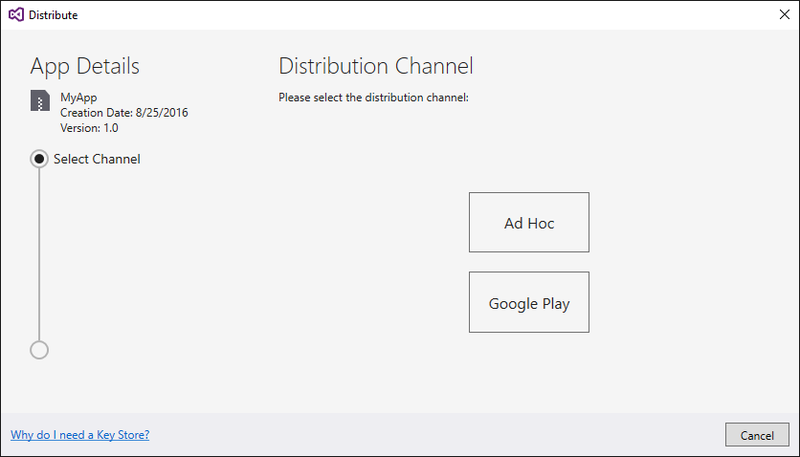 It also allows the user to start the Distribution workflow or open the folder where the distribution has been created. 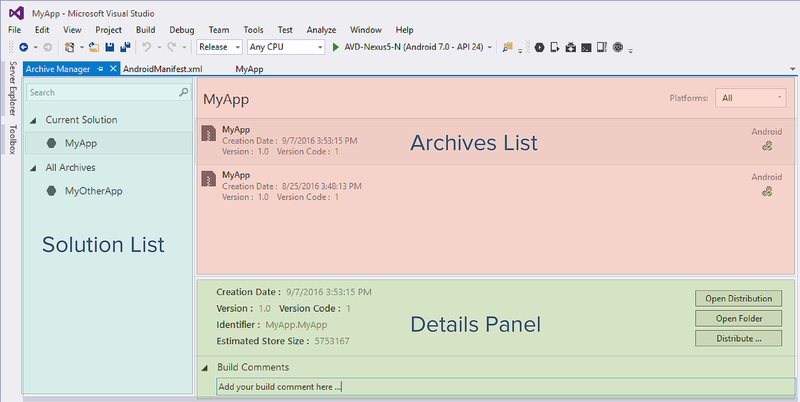 The Build Comments section makes it possible to include build comments in the archive. Ad-Hoc – Saves a signed APK to disk that can be sideloaded to Android devices. Continue to Signing the App Package to learn how to create an Android signing identity, create a new signing certificate for Android applications, and publish an ad hoc version of the app to disk. This is a good way to create an APK for testing. 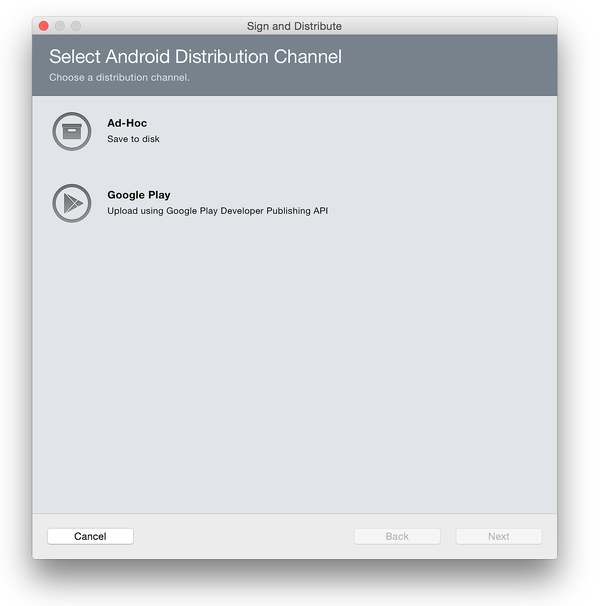 Google Play – Publishes a signed APK to Google Play. Continue to Publishing to Google Play to learn how to sign and publish an APK in the Google Play store. Ad-Hoc – Saves a signed APK to disk so it can be sideloaded to Android devices. Continue to Signing the App Package to learn how to create an Android signing identity, create a new signing certificate for Android applications, and publish an “ad hoc” version of the app to disk. This is a good way to create an APK for testing.